Citing sleazy examples such as the Export-Import Bank, I’ve offered some serious analysis about controlling political corruption by shrinking the size and scope of the federal government. But perhaps the Louisiana approach is the right way. Here’s a cartoon sent to me by a buddy from the Pelican State. 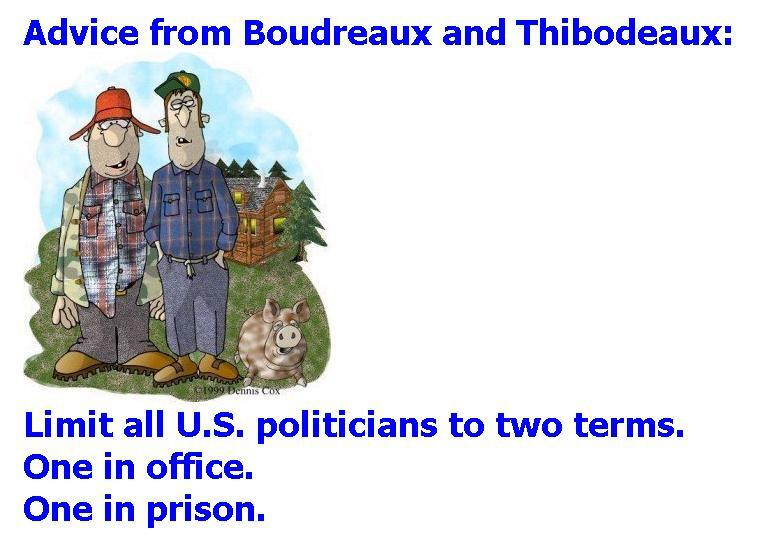 Though I wonder whether Louisiana is the right example. Illinois has a pretty impressive group of recent governors who have gone to prison, leading to some amusing jokes from Conan and Leno. For general abuse of politicians (which is almost always a good thing), here’s a good collection of humor, including this one showing the mindset of a politician, this one about why it’s easy to operate on politicians, this one about a politician visiting flyover country, this one about a politician in a bar, this one about Little Johnny copying politicians, and this one showing the relationship between people and elected officials.